I have driven past Putrajaya Equestrian Park (Taman Ekuestrian Putrajaya) a number of times and it always seems as if not much is going on. Recently I went inside to take a look around. 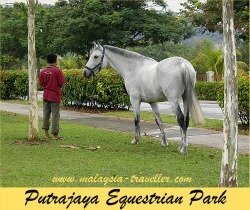 This equestrian centre is not very well known and like many of Putrajaya's impressive recreational facilities it is under-utilised. It has a riding school open to the public at reasonable rates with packages for beginner, intermediate and advanced riders. I saw a number of horses and ponies stabled here, some of which might be privately owned. I am not an expert on horses but they looked like they could do with some company. I am sure they are being well looked after but they were being plagued by flies that hot afternoon. If you are a 'horsey' person, why not go along to Putrajaya's Equestrian Park and take the horses for a ride? Minimum age for children: 7 years. Riding helmets are available for rent. Basic horse sense, safety rules and how to take care and handle the horse. Names of parts of the horse's body and names of equipment. How to mount, seating position, hand position, how to dismount. Basic horse control - how to start, stop, turn, basic figures. Control and sitting at the trot. How to gain confidence and relax. Horsemanship theory, care and handling of the horse. How to saddle and adjust tack. How to maintain the balance of horse and rider. The centre also has equestrian and polo fields, dressage arena, grandstand and paddock and hosts the occasional racing and show jumping event. There is a restaurant, Mangiamo Café which is open from 8am - 10pm. The club house area also is available for corporate functions, weddings and so on. Putrajaya Equestrian Park is located close to PICC and the Pullman Putrajaya Hotel. The location is marked on my interactive map on the Top Putrajaya Attractions page.